City Hall is a commanding presence in the heart of downtown New Orleans. Few sites can match it. Like many of us, I was stunned to hear you mention moving City Hall to the Municipal Auditorium. This is not the first time the idea of moving the seat of city government has come up. Mitch Landrieu pushed for relocating City Hall to the vacant Charity Hospital building; Ray Nagin angled for taking over the Chevron building. Thankfully, your administration quickly backpedaled and said a decision on relocation would require study. So, here’s food for thought: The Municipal Auditorium reflects the aspirations of the City Beautiful movement which sought to bring beautification, monumental grandeur, and civic virtue to urban environments. The Italian Renaissance-inspired architecture speaks to the classical values of order, dignity and harmony. I nearly fell out of my seat at the BGR Breakfast Briefing when, along with moving City Hall to the auditorium, you proposed increasing the building’s height! While I agree with demolishing that hideous addition at the rear of the building, I’m curious to know what raised height would be used for and how it would relate to the historic structure. Are you thinking of exceeding the height limit? It’s only 50 feet in Armstrong Park, which is roughly four stories. The greatest benefit of relocating City Hall to Treme would be the removal of that awful eight-foot fence that blocks the neighborhood’s access to Armstrong Park. The fence sends a bad message: you’re not wanted here! And that’s not a good look for a City Hall. More importantly, Treme has suffered from nearly a century of harmful planning decisions and crippling disinvestment, beginning with wrenching the land from Black families to build the auditorium in the first place. The bitter history of Treme’s destruction is forever linked to both the Municipal Auditorium and Armstrong Park. They stand as emblems of bureaucratic and racial arrogance. A place with such a painful history is not appropriate for a City Hall. Thank goodness Charity Hospital is off the table! I couldn’t imagine the city paying more than $70 million in rent over the course of 10 years, as projected by the Urban Land Institute study for Charity. I know the hospital is an important piece of the urban landscape. But it does not command a prominent place downtown. The grey sweep of Tulane Avenue, which is compromised by the looming presence of Interstate 10, does not offer a celebratory approach to the building or the strong street presence that’s required for a seat of government. Take a minute and close your eyes. Imagine a renewed City Hall with a streamlined interior. It would be the centerpiece of a cool, confident city that understands the power of place. I realize a lot of people hate our current City Hall. They call it ugly, mistaking its deteriorated condition for a fundamental design flaw. But the building, with its glass curtain wall and spare lines is a unique example of the Mid-Century Modern style. Its architectural language speaks to principles of honesty, purity and transparency—virtues that New Orleans should not disown, however often they have been betrayed by insider deals and graft over the years. Naysayers further claim the iconic 1957 concrete, glass and steel building is too old to accommodate a 21st-century government. But that argument is hard to buy in a city where everything is old. Both City Hall and the Municipal Auditorium are historic. Both would have to be renovated. So, the question becomes which one of these would make the best City Hall and represent New Orleans as a modern, world metropolis that champions democracy? Our City Hall should be an anchor. It can’t be isolated, with no relationship to other vibrant buildings. The Municipal Auditorium is an object in Armstrong Park’s kitschy, Post-Modern landscape and does nothing to animate the surrounding streets. The Basin Street entrance is set back and doesn’t actively engage the public. To make matters worse, it willfully fails to engage Rampart Street. And the building’s other entrances are either hidden by Congo Square or face the interior of Armstrong Park. The nearby Mahalia Jackson Theater is dormant 80 percent of the time; and the dilapidated historic houses that stand as painful reminders of eminent domain are never used. It’s a dead zone! The auditorium cannot establish the civic presence deserving of a city hall. It sits at the edge of a passive park and two residential neighborhoods. Its proximity to the RV park across the street does not help! You could argue that the nearby police and fire stations enhance the auditorium’s civic setting. But those buildings lack the gravitas to support the importance that an urban city hall should radiate. In contrast, the City Hall we’ve got occupies a position in our landscape that’s impossible to replicate downtown or in any other part of the city. 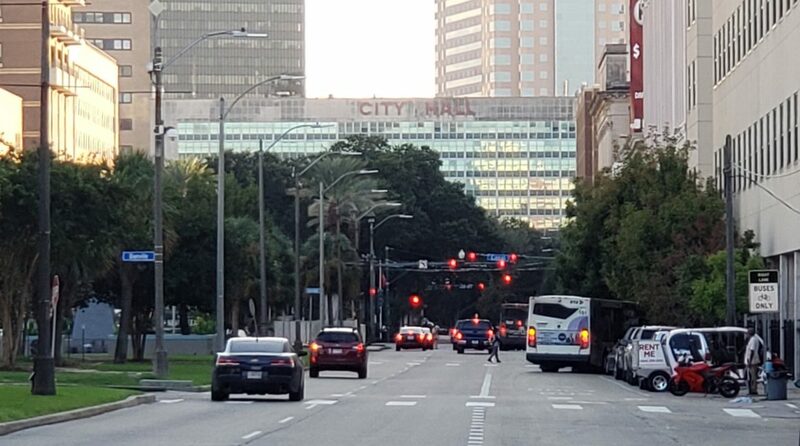 The building is thoughtfully situated at the intersection of Loyola Avenue and Poydras Street, a nexus of business and government. Next time you’re riding or walking along Basin Street, notice how the building comes into focus and stops your view, establishing its power and authority! Our City Hall was designed as the primary component of an important civic space. The building’s large terrace and its adjacency to Duncan Plaza speak to the significant contribution it makes to the democratic process. People have protested, held press conferences, mocked politicians and forged long-lasting friendships and partnerships in this cradle of civic engagement. It is one of the city’s most recognized civic spaces, a stage for political and social experiences that excite and empower us. City Hall is constantly surrounded by people. And that helps to create a strong sense of place, a fundamental part of a vibrant urban experience. It’s a place where the community can be comfortable and have a real sense of ownership. Creating great places should always be at the top of our agenda. Adequate is not acceptable. Extraordinary must always be our goal. If our intent is to position New Orleans as a high-tech, modern city that provides opportunity for all, then it makes the most sense to gut and renovate a modern building that is central to the hum of city life and speaks to our values. Rather than tear down City Hall and sell the land to the highest bidder for a one-time jolt to the municipal revenue stream, let’s exploit the opportunity that comes with the relocation of the Civil and state Supreme courts. City Hall could expand into the Civil Court building, and you could add workplace amenities that might include a café and an employee gym! Take a minute and close your eyes. Imagine a renewed City Hall with a streamlined interior. It would be the centerpiece of a cool, confident city that understands the power of place. I gained experience helping West Palm Beach, Florida, transition from one City Hall to another. As staff, we were charged with creating what New Orleans already has: a vibrant center of municipal politics in the heart of the city. Our City Hall engages the public from a commanding and unique place in a dynamic urban environment. Committing to stay downtown at the pulsing heart of our city—and making Duncan Plaza an even more significant part of our public life—would be a wonderful contribution for a young new mayor to make. Best of luck during your term.